In the same format as our series on ‘old towns’ and Scottish industries such as shale mining, this is a compact but well-written illustrated history on Scottish hospitals. 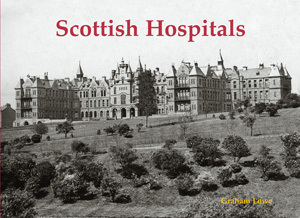 It’s not comprehensive in the sense of illustrating all of the many Scottish hospitals but it does tell the story of how hospitals developed in Scotland and the many varying types that have existed, as well as going around the country with different examples to provide a good geographical spread. Early voluntary and teaching hospitals became the big infirmaries in Edinburgh, Glasgow, Dundee and Aberdeen, and all are shown here. Then there were district general hospitals, cottage hospitals, infectious disease hospitals, sanatoria, hospitals for incurables, Poor Law hospitals, convalescent hospitals and war hospitals. Two or three photos are featured of each type to give an overview of the history of our residential medical care.